Boom microphone clamp specifically for Bell Mag-9 Sena and Qualifier DLX Helmets. Note: This kit is necessary when mounting a Sena SMH-10 to a Mag-9 Sena or Qualifier DLX helmet, but is included with the Bell Mag-9 Sena SMH-10 Bluetooth Headset. I purchased this to install on my Bell helmet for my Sena headset. Install was easy, and the Sena snaps right in place like it is supposed to. The speaker quality is pretty good, but don't expect thundering bass from a speaker the size of a half dollar piece. I do wish that it came with the smaller wire mic, vs the boom, but not a deal breaker. Overall, I'm very satisfied with my purchase. I would not buy this item again. The speakers are very weak when riding and using ear plugs (which is a must if you want to keep your hearing). Spoken text is very difficult to hear, but music is decent enough, if you don't like bass, as there is no bass whatsoever. This mounts easily into the helmet, and despite my worries, the boom mic never felt like it was in the way. However, the speakers on this thing are just way too quiet to be useful in such a loud helmet. I bought this to connect the Sena 10S to my Bell Qualifier helmet. One of the main reasons I bought that particular helmet was the ability to mount the Sena unit directly to the helmet, because I really like how much cleaner of a look it is, and lower profile, which I anticipated would lead to less wind noise. What is not mentioned is that, while the Sena 10S allows for the swapping out of the microphone, speakers, and has a jack for aux in and to plug in your own headphones, ALL of that functionality is built into the universal mounting bracket, not the unit itself. This mounting bracket that is specific for the Qualifier helmet, however, provides NONE of those options. The speakers and boom mic are hardwired into the mounting bracket, meaning short of disassembling the bracket and doing some soldering, you aren't able to swap out the mic or the speakers. This bracket also does not include the aux in port, nor the port to plug in headphones, meaning much of the functionality of the 10S is lost if you use this bracket designed for the helmet. I'm really disappointed, both in this poorly thought out design by Sena, where all of the functionality is not in the bluetooth unit itself, as well as in Bell, Sena, and Revzilla, for not better communicating this fact. Had I known all of this up front, I likely would have bought a different helmet, and possibly a different bluetooth unit. Unfortunately, because I got my helmet before the Sena unit, and already put a few scratches in it, I'm now stuck with all of it, which is a huge bummer. The speakers are also absolutely awful. There is literally ZERO bass. not even a little bit in the background, just none whatsoever. The treble is absurdly high, makes me cringe whenever a snare drum comes on. -Install is super easy, and the bracket does mount pretty much seamlessly. -The mic does an excellent job of cancelling wind noise. Talking on the phone at 55 mph the other person has no idea I'm even on a bike and not talking directly into my phone inside a building - I've asked. This is especially beneficial as I don't think my helmet is terribly quiet to begin with. All in all, however, unless you care more about the aesthetic of having the Bluetooth unit fitting the helmet (which I do have to admit, looks good), than any of the above, I can't recommend it. Purcahsed this unit to match up with our Sena unit and Bell Mag 9 Sena helmet. Couldn't been an easier set up to make the Sena marry up with this helmet. I picked this up to go with my 10S, But it doesn't look like i can switch my speakers to the 10S's speakers, and the sound quality from an audiophile's perspective or horrid. The signal to noise ratio is terrible and there's a lot of excess static and distortion in your sound. Things are still clear but i really think they could have used a higher ohm impedance speaker to help with the speaker clarity. My wife and I both own Bell Mag 9 Sena helmets and the Sena SMH-10 intercoms. This clamp is required to adapt the SMH-10 to the Mag 9. Super easy to install in a Mag 9. I've installed intercoms in other helmets, and let's just say that I invented new swear words in doing so, so I really appreciate a helmet and intercom system that are designed for each other. Now my wife loves her Mag 9, but I didn't get along with mine, so I just replaced it with a Qualifier DLX. It was easy to remove the clamp kit from the Mag 9 and transplant it into the Qualifier DLX: again, the helmet is designed for the intercom and clamp kit. I only struggled a bit getting one of the cheek pads re-aligned, but the clamp, mic, wires, and speakers first perfectly. One machine screw holds the clamp solidly in place, and both helmets have speaker pockets. How well all of it actually works will depend a lot on your bike. With the Mag 9, I had too much turbulent air above 45 mph for the intercom to work, even on a faired sport tourer. I'm tall, so well above the windscreen. I'm thinking the closed faced Qualifier will be a much cleaner environment for the intercom to work in. Generally speaking, I like my Sena SHM10 bluetooth mic and speakers. Sound clarity is excellent when making calls and speaking with others over intercom. It's a bit silly that Sena charges this much for an additional part just so that their SMH10 works with the Bell helmet. With that said, installation was easy (good YouTube videos to follow) and everything worked. One big gripe I have is that the SHM10 normally has both bluetooth connectivity and also allows you to plug in an AUX audio plug for music, walkie talkies, etc. With the adapter to make it work for the Bell helmet, the AUX port goes away and is no longer available, forcing you to connect to everything with bluetooth only. This is annoying if you want to connect, for example, a music source and a GPS source, or if you want to use inexpensive radios transmitters to communicate with others traveling with you, including in cars. This kit is not a good fit for a DLX Qualifier. BEFORE install in the helmet this kit fit my Sena 10s (out of a Sena 10 2 in a box deal) and worked perfectly. When installing into the helmet though, the clip that should click into place did not, would not, could not, the slot in the helmet prevents it from clicking into place.. The 10s headset does not feel, even without this kit installed, like it is right for the helmet, have to press pretty hard to get the bluetooth headset into the slot. I didn't want to modify the Sena unit as I have several helmets to use them in. I did notice after having the problem that when I went back and listened to the videos on utube, they all show an SMH10 headset plugging in and not a 10s. The Helmet shown in the video seems to be a 2013 and Bluetooth unit appears to be an SMH10. I have a 10s and it looks different. Features wise, if you buy the generic clamp you get to use external headsets, that is removed in this version. 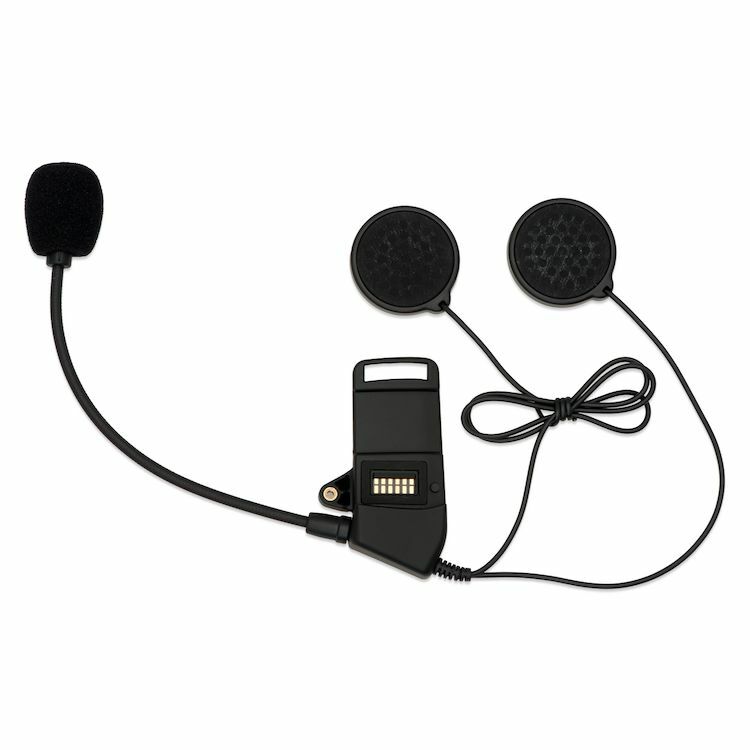 Also there are 'wired' microphones available that some may find more useful, they cannot be used either. I did get my 10s working, but spent a day working on it. It works perfectly with only the speakers and mic provided, but I would prefer to use my external headset. There is apparently more than one version of the installation directions. The ones I received were poor compared to the the ones emailed me after I contacted Revzilla. Mic could use an additional oversized wind sock to go over the existing sock to cut more wind noise. Speakers tend to move when helmet is put on; better anchoring needed. This could be a helmet issue vs. a clamp kit issue. Speaker pocket material is not taut enough to keep speakers in place.